In January, we got a sneak peak of Trango’s newest belay device, the Vergo. Since then, this device has been kept top secret. We’re now excited to share what we’ve learned about it (and we’ll update this post as we get in some extensive testing time!). As a user experience geek myself, I was stoked to hear that from the very beginning of the Vergo design process, a PhD in Ergonomics was included in the project. Trango wanted the Vergo to be intuitive to use mentally and physically as they aimed to create a smooth, simple, and ergonomic experience. This dedication to usability resulted in Trango expanding the scope of design beyond the mechanics of how the device grips a rope, to include every aspect of how a belayer uses the device. This meant studying how climbers interact with and instinctively use belay devices, and how that behavior impacts the performance of the device. As every manufacturer, Trango wanted the handling and operation of the Vergo to be highly intuitive. Thus, they added natural cues that indicate how to hold the device. This includes a thumb knob and a forefinger rest to encourage the most ideal holding position. These added usability features are beneficial for strongly reinforcing proper belay technique, especially as more and more new climbers enter the sport. The loading and lowering functions of the Vergo operate similarly to other mechanical brake assist devices. And yet the Vergo also brings improvements to the table. We’ve noted the similarities and differences below, after the technical specs. For mechanical devices the Trango Vergo is right on par with all the others at 8.9 – 10.7 mm. While comparing similar devices, the only real outlier is the CAMP Matik, which handles ropes down to 8.6 mm. 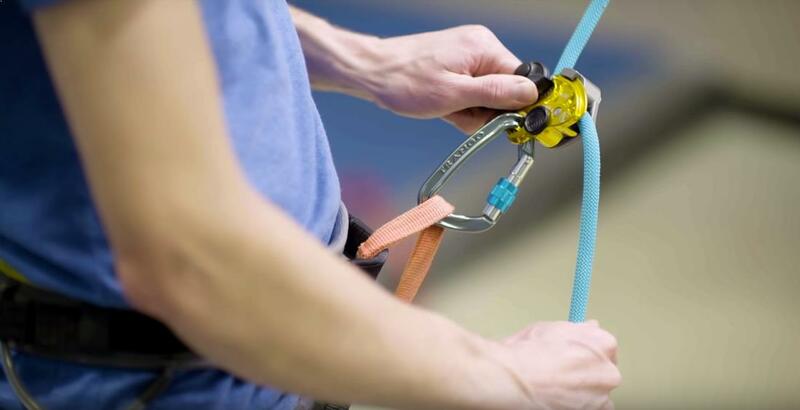 If you’re using skinny ropes you’ll want to depend on one of the non-mechanical brake assist devices like Mammut’s Smart Alpine and Edelrid’s Micro Jul. These devices can handle ropes as small as 7.5 mm and 6.9 mm respectively. The initial price has been dropped to $89.95. This is $10 below the Petzl GriGri 2 ($99), the most common price for brake assist devices. It’s also half the price of the $199 CAMP Matik. Interestingly, it’s only $5 more than Trango’s original offering of the Cinch but with substantially more design upgrades. At 195 grams, the Vergo falls along the standard weight range of the other mechanical brake assist devices. It’s 25 grams heavier than the Petzl GriGri 2, and a whopping 81 grams lighter than the CAMP Matik. Warning: This post includes general use descriptions but should not be considered a proper guide. Please refer to Trango.com for official instructions on using the Vergo. And/or watch Trango’s Instructional Video. The loading is similar to most mechanical brake-assist devices: Spin the front plate open, rotate the handle, load the rope according to the icons, close the front plate and clip with a locking carabiner. All pretty straight forward, even for new climbers. Note: Seasoned GriGri users will immediately notice that this device loads in the opposite direction of the GriGri. For the Vergo, the climber’s side of the rope will be coming out of the bottom of the device (left side in the picture). This shouldn’t be an issue as there are plentiful informative icons during this process and a standard tug test is always the best way to ensure the device is ready to engage. There are climber and brake hand icons inside the loading area and these icons are also on the outside of the device. Additionally, Trango has added an arrow icon on the side of the device that confirms you’re clipping the device correctly. One big difference compared to most brake assist devices is how you hold the Vergo during use. Unlike most mechanical devices, the Vergo is designed to be held flat (horizontally). This allows the belayer to feed slack with a more natural motion and reduces strain on the shoulder. Although this may not be a “standard” position with other devices, it is quite simple to understand as the indented thumb and index finger groove are helpful cues that provide tactile feedback. These cues provide an intuitive place for your hand to return to the device after taking slack. This also means that you can keep your eye on the climber instead of needing to visually check your hand is in an OK position on the device. You’ll primarily be feeding rope horizontally, which makes sense since you’re already holding the device sideways. With practice, this horizontal method will allow you to pay out rope smoothly, quickly, and safely while reducing unwanted device lock-up. To quickly give slack without locking up the device, there is an official method to momentarily disengage the cam with the same hand that is about to pay out slack. This is a fantastic feature for any belayer who accidentally short-ropes the climber or needs to feed rope fast. 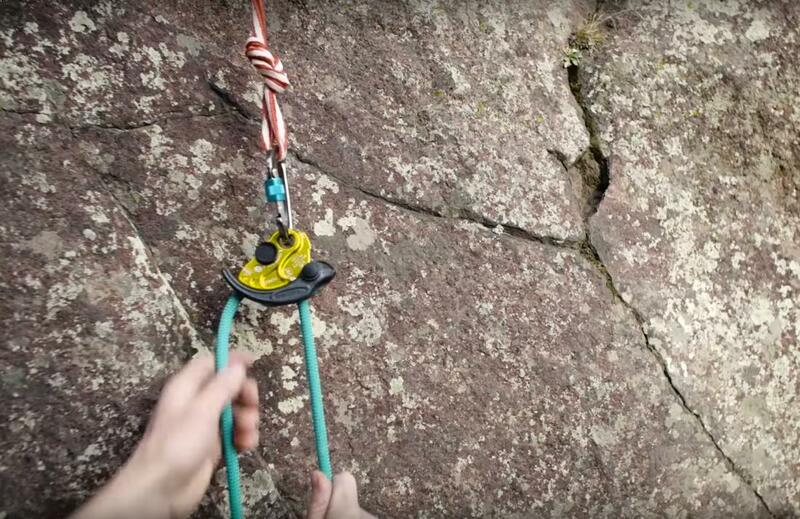 As seen in the GIF below, to accomplish this the belayer places their palm against the small fin on the top plate, wraps their fingers around the rope, closes their grip, and then quickly feeds slack. At the moment the belayer closes their grip on the rope, the device is in the fully open position, similar to if the handle was open. But (and this is key! ), if a climber falls at the precise moment the cam is disengaged, the belayer’s hand that’s holding the rope (about to give slack) is pulled away from the disengagement area and the Vergo instantly locks up. Worth Noting: Most brake assist devices are “overridden” when you use it in a way not suggested by the manufacturer–such as opening the brake handle or squeezing the device–to disengage the cam to feed slack faster. Using two hands to do this adds to the complication. With one hand you are actively overriding the device, while the other hand is feeding out slack quickly. If a climber falls during this time, the disengaged cam will not catch them until you actively make a move to stop overriding the device. The release lever operates similarly to other mechanical brake-assist devices: Pulling the lever releases the rope, and the speed of the lower is based on the degree that the handle is rotated. The usability bonus is that Trango has added a small thumb indentation to the handle that adds control while lowering. Another valuable feature of the Vergo is its ability to capture every inch of rope pulled through the device while belaying from an anchor. Ethan Pringle, who’s tested the device first-hand confirms that it captures slack “nicely and evenly.” We can’t wait to test this feature. Many similar devices do a poor job of capturing all of the slack pulled through the device, requiring the belayer to do redundant work. Ethan Pringle summarizes his experience using the Vergo saying, “It doesn’t feel like Trango designed a product. It feels like they designed a smooth user experience.” And with all the intention that went into making this device simple to use, we’re excited to get our mitts on it and test it out first hand! Final Notes: We’ll update this post with our experiences once we’ve exhaustively tested the Vergo. And we’ll do another update when the Vergo is available and link all the retailers we know who sell the device (these will be affiliate links, where we get a commission if you buy. Buy it only if you want it). Also, thanks to Trango for providing resources and photos that enabled this post to happen. Holy crap that looks awkward to work with! And that twist you give it to work horizontally? I can only say i’m really sceptic! Thanks for sharing Mikkel! If it helps, the twist looks more intense than it is actually feels. It’s really similar to using a tuber and lazily pulling in slack from the side (instead of straight ahead), and having the tuber twisted towards your hand. Similarly, it’s not uncommon for me to notice, while I’m lowering my heavier partners with a tuber, and putting the brake side of the rope more to the side to increase friction, that my setup twists slightly as well. Neither of these situations have felt uncomfortable or awkward on the belay loop or belaying process. But thanks to your comment, we’ll be sure to focus specifically on this area as we continue testing the Vergo. What about Left handed climbers – LEFT out in the cold again? So true…At least you have the ambidextrous Edelrid MegaJul, Mammut Smart and Climbing Technology Click up! !